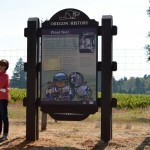 Oregon’s successful and widely recognized wine industry can be traced to this place, where Richard Sommer first planted Pinot noir grapes in 1961. The Umpqua and Willamette valleys’ climates and topographies are much like those of European wine regions, but most winemakers of the 1960s believed it was impossible to grow fine wines in Oregon. 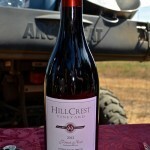 Sommer, however, recognized the significance of sharing latitude with European winemaking regions, including Burgundy, and took a chance with his HillCrest Vineyard —Oregon’s first winery to plant and bottle Pinot noir for commercial sale. Sommer’s gamble paid off, and Oregon’s Pinot noir wines have been internationally recognized since the late 1970s, when a vintage ’75 bottle from Eyrie Vineyards won first place at a competition in Paris. The emerging wine industry also benefitted from Oregon’s political and social climate. The state passed groundbreaking land-use legislation in 1973, mandating that all cities and counties create comprehensive plans that protect agricultural land from development. 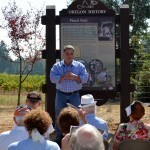 Richard Sommer co-founded the Oregon Winegrowers Association in 1965. The association became the Oregon Wine Board and continues in its work to support the industry through marketing, research, and education initiatives. In the late 1970s, winegrowers imposed on themselves strict labeling restrictions and assessed a self-tax that supported important research efforts.